I received an email a little while after my Monday program aired on KUMD. 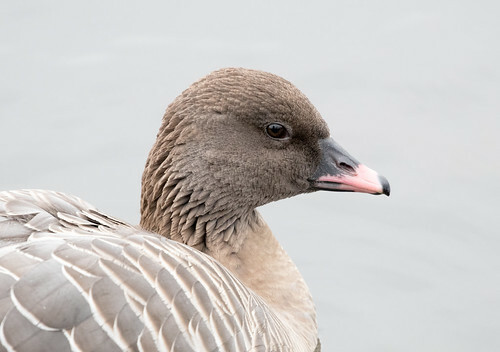 The writer said he’d looked at all the photos I’d posted on Flickr of the Pink-footed Goose I saw in New York City, and not one of them showed the pink feet. He wondered how I could be sure of the identification. 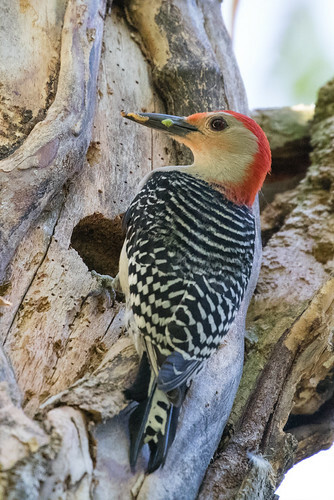 Many birds are named for distinctive features that aren’t always visible in the field, and some of those distinctive features aren’t unique to those species. 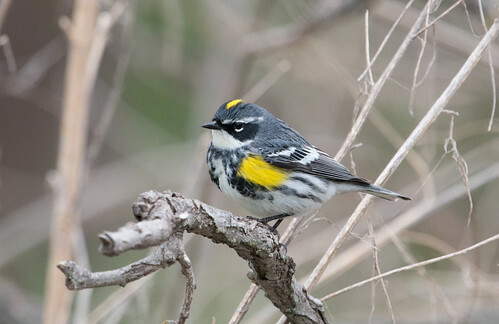 Yellow-rumped Warblers don’t always part their wings to show their rumps, and a few related warblers also have yellow rumps. 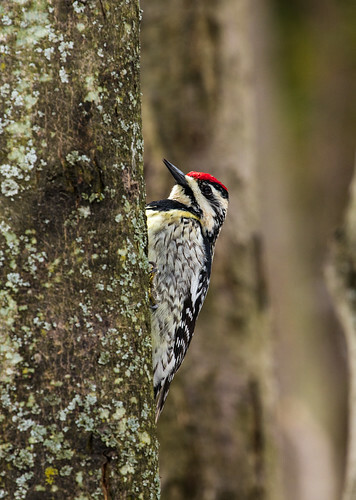 Yellow-bellied Sapsuckers and Red-bellied Woodpeckers both keep their bellies hidden against tree trunks during normal activities, and most individuals of both species lack any noticeable belly coloring even in the hand. 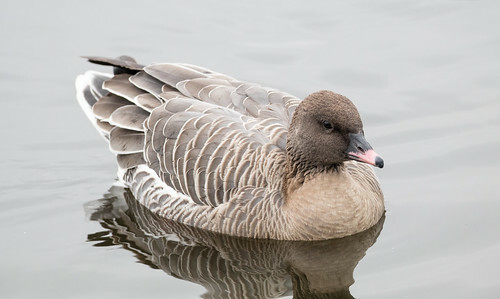 By that standard, Pink-footed Geese are actually fairly appropriately named, though to see the pink feet, the bird does need to be standing on land or flying without its feet tucked. The entire time I watched the New York bird, it was in the water, its feet entirely submerged. Fortunately, those feet are not the only way to recognize the bird. 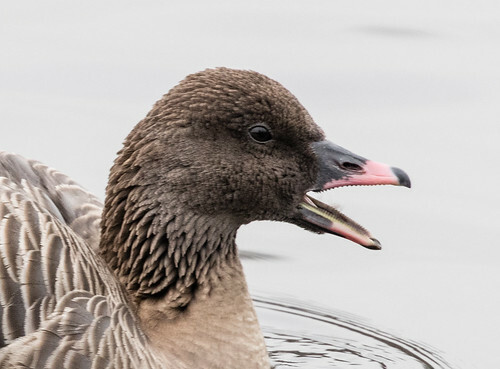 The only all-dark-headed goose that might be confused with it in North America is the White-fronted Goose, and a bit of conspicuous white at the base of the bill excludes that. 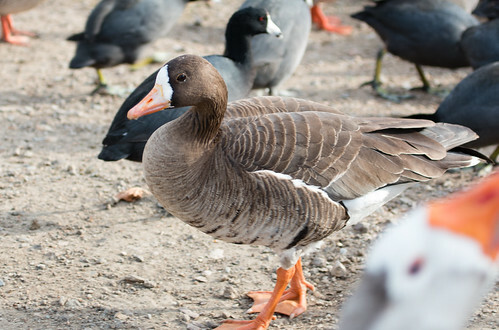 The extremely rare Graylag Goose and Bean Goose both have orange feet, and do not have conspicuous pink on their bills. 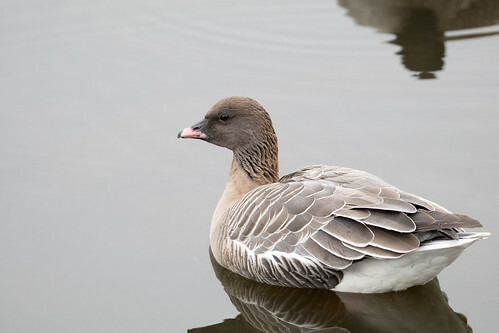 My goose showed the proper plumage and very conspicuous pink on the bill, so there was no doubt about its identification. My friend, the Port Wing artist Jeanne Perry, asked me, “Didn't the pink-footed goose figure heavily in one of the scenes from “The Big Year”? Jeanne remembered correctly. I’m still out of town so don’t have a chance yet to rewatch the movie, but in the scene where the characters played by Jack Black, Steve Martin, and Owen Wilson are on High Island in Texas during the huge migration fall-out, someone yells about a Pink-footed Goose being seen off the boardwalk. Owen Wilson plows right through a group of girls and their teacher or scout leader, but Jack Black and Steve Martin wait until the girls all pass through. 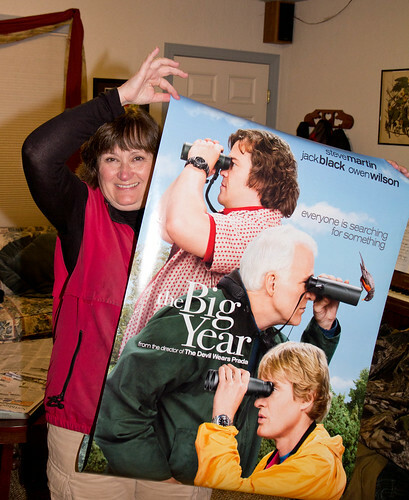 Of course Owen Wilson gets a quick look before it flies away, and gloats about it. Later, the woman Jack Black has fallen for calls him about one being seen near where she lives in Boston. He takes a bus there, and she meets him with her boyfriend. Jack Black is distressed about her having a boyfriend in the first place, so he goes ballistic when the guy comments about his coming all that way to see a “pink goose.” To add insult to injury, of course Jack Black misses the bird again. Finally, near the end of December as the Big Year is drawing to a close, Steve Martin finds out about a Pink-footed Goose impossibly hanging out in a small bit of open water in the Colorado mountains and brings Jack Black to see it. Pink-footed Geese are definitely rare birds here in the US—they breed in Greenland, Iceland, and northern Scandinavia, and winter in Europe and the UK. Individual vagrants do turn up rarely in the US, and although this is extremely rare, they often do stay put for a month or longer, as the one at Arthur J. Hendrickson Park has been doing this year. It’s not the kind of bird I’d ever hop a jet and fly across the country in hopes of seeing, but as long as I was in New York anyway, I gladly hopped aboard a commuter train to see it, whether or not I got to see it showing off its pink feet. Somehow Google deleted what you said, that "As for your comments about the movie being in error about possibly seeing a Pink-footed Goose in Colorado... one was reported seen by several birders today, December 11, 2018, east of the city of Longmont!" But the movie, made in 2011 about a Big Year that had happened in 1998, put a Pink-footed Goose in Colorado (in a tiny, icy puddle in the mountains!) long before any Pink-footed Goose had ever been seen in the state.